Bowl a striker with these fun bowling rubber ducks. The bowling rubber ducks are a fun alternative to a traditional rubber duck. …available options for a duck race or a duck pond. These Plastic ducks are great. Coming in 3 colors pink, yellow and blue, these ducks will surely be a hit at your next party. One of the least expensive options when you are buying in bulk these ducks are just what you need to have a great duck race. …options for a duck race or a duck pond. These Yellow plastic ducks are great. Coming all in yellow so they all match, these ducks will surely be a hit at your next party. One of the least expensive options when you are buying in bulk these ducks are just what you need to have a great duck race. Peace, love and rubber ducks. These great hippe ducks are a fun way to show some disco spirit. Pink pirate ducks are a fun addition to any pirate party. 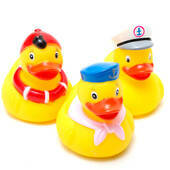 The Pink pirate rubber ducks are a favorite amongst girls and are great for bath time fun. Add some pink flamingos to your duck collection. These pink flamingo ducks work great as a fun luau decoration. Or you can bring flamingo flocking to your office. Flock a co-workers desk with plenty of pink flamingos. These fun pink flamingo rubber ducks will surely be a hit. Police rubber ducks are a great way to add some extra fun to your duck river race. If you are having a fund raiser for your local police officers these rubber ducks are a great way to get your rubber duck race into the right theme. Get rocking with these rock star rubber ducks. These rubber ducks are the classic big haired rockers that you would expect for rock stars. Meow!!! These cute cat rubber ducks are a fun alternative to a classic rubber duck. If you are having a fundraiser for a humane society or an animal shelter these rubber ducks are a great addition to the party. These plain white ducks are a great alternative to a traditional rubber duck for a duck race. Send these ducks home prior to the race and have each contestant decorate there duck in their own unique way prior to the race so that they can watch their duck make its way down the river. Coming in 4 fun designs these dinosaur ducks will surely be a kid favorite at your dinosaur themed party. Take a slapshot with these fun hockey ducks. Coming in several great colors there is surely a hockey duck that represents your team. Here they come to save the day, the super hero ducks are on their way. Coming in 6 different superhero designs these ducks will surely save the day. Give these super hero ducks as favors at your next superhero party. These fun Army ducks are a great way to show you patriotic pride with a little extra fun. The Army ducks will surely win the ducky race because no one ever beats the Army. …in your bathroom as decoration for thanksgiving. Put them around your soap dish or anywhere you want to give your guests a fun little surprise. These Thanksgiving rubber ducks are perfect for any autumn time duck river race. Never been in charge of setting up a Duck river race? Learn how below. these are the economy rubber ducks, if you are looking for a lot of ducks for a low price these are the ducks for you. 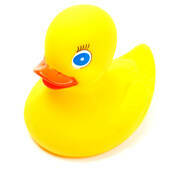 The economy rubber ducks are made of a thin rubber and designed for one time use outlook.